The precious Wishfulfilling Jewel is shaped in a fiery triangle with rounded eggs. Its meanings revolve around the concepts of unlimited wealth, increase and unfolding: wish fulfillment in the widest sense. It symbolizes the plenitude of boundless power and possession of eight properties. It is a powerful symbol of lights of various colors that radiate upwards. This beautiful wealth-granting jewel guarantees quick generation of wealth. 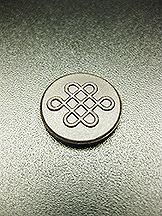 It symbolizes the realization of all possibilities in good fortune. If placed at cashier register, office table, N and SE corner of the home, mountain star#8 or even location of annual Star#8, the location of Purple Star #9, it guarantees prosperity for you. This is said to bring in lots of wealth, good fortune and money to the family. It is also a perfect centerpiece for homes. A suitable gift for yourself and your loved ones to increase their income, speculative and wealth luck! 1. Its fiery symbolism represents lights that shine for us at nite. In the afternoon, this light will overcome heat. 2. When one travels and suffer from thirst, a great river will appear to quench all the thirst. 3. The universal monarch thoughts will arise from the jewel. 4. Light of various colors, namely blue, yellow, white, red and crimson will radiate. 5. The jewel blesses one with good health and prevents sicknesses. 6. It prevents terrible rainfall caused by the nagas. 7. Trees, ponds, parks, lotuses and gardens are perfected. 8. Untimely death can be avoided. 1. Displaying it in the southeast sector (wealth sector) of living rooms and business premises energizes income, increase in wealth and prosperity and windfall luck. This is the most powerful sector to transmit your home's chi to become prosperity chi. 2. Display it in the northwest to increase money luck from important people and helpful people. This is important for business pursuits and careers. Placing it in this sector will also bring you heaven luck. 3. Display it in the north if you're seeking for material gains in career through more recognition and promotion opportunities. 4. Display it on your work desk to create a differentiator between you and your competitors so that you could stay at the forefront of career advancement. 5. Display it in the center of the home to ensure ultimate wealth success. Such placement does increase your money luck and speculative luck too. 6. Display it at Annual Star #9, Mountain Star #9 and Water Star #9 locations to invite long term money luck and stability. Energy infused. This energy tag is hidden inside the screwed base of the jewel.